This year’s Moto G has been the subject of many leaks. First some pictures and even a video of the device appeared online showing Motorola would follow the same design language as in previous versions. Although, a new module could be seen in the back and which includes the camera, LED flash (which now seems to be dual-toned) and the dimple with the company’s logo, improving the ergonomics of the device. Then, some very colorful pictures of the device (resembling an Andy Warhol painting) emerged and suggesting users could now use the Moto Maker tool to customize the back of the phone with a variety of color options as well as the aforementioned module which appears to be made out of metal. More recently, a dummy of the phone was spotted with some specs which seemed to confirm the phone would be IPX7 certified for water resistance, the cameras will be 13-megapixels on the back and 5-megapixels on the front, 4G connectivity and a 2,470 mAh battery. The rest of the specs are somehow ambiguous, although the suggestion was the screen would measure 5 inches with an unknown resolution. The processor is quad-core, but there’s no way of knowing the brand or speed. These uncertainties have created much speculation about the possibility that Motorola could launch two versions of its mid-range offering, one with a Snapdragon 410 processor and 1 GB of RAM and the other one with Snapdragon 610 processor and 2 GB of RAM and even the possibility of one of these two versions, sporting a Full HD screen has been discussed. Now, a price card of the new Moto G has emerged which contains some more information. The card is for the Canadian carrier, Telus and confirms the availability of the device in Canada. It also confirms the IPX7 certification and it states that the phone can be submerged in up to 3 feet of water, for up to 30 minutes. The display would carry an HD resolution, so the previous theory might not end up being correct, and the battery would hold up for an entire day which seems to suggest the company has been working on some software optimizations. Anyway, whether it is one or two versions, all will be known during the event on July 28th. 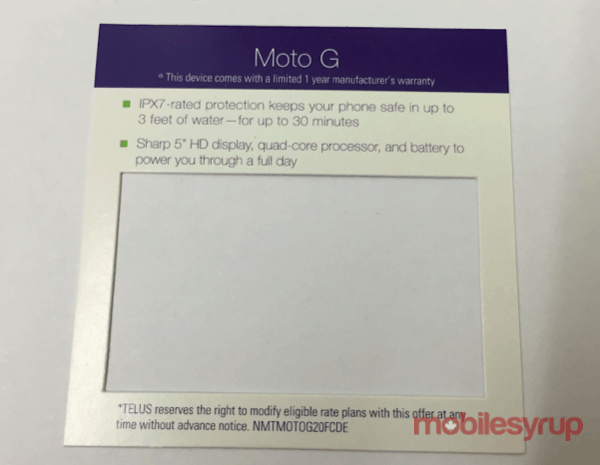 The post Price Card For The Moto G (2015) Confirms Some Details appeared first on AndroidHeadlines.com |.